While the Champions League final has been billed by some as Cristiano Ronaldo versus Mohamed Salah, there is perhaps a more intriguing head-to-head battle in the Europa League showdown between Marseille and Atletico Madrid. Antoine Griezmann and Florian Thauvin, arguably the two most consistently deadly French attacking players of the season, will go head-to-head on Wednesday – in Lyon, fittingly – in a tantalising match-up. Such has been the form of Thauvin that the possible absence of Dimitri Payet has become less of a concern, while Griezmann continues to be Atletico's go-to hero, even if it seems likely he will move to Barcelona before long. 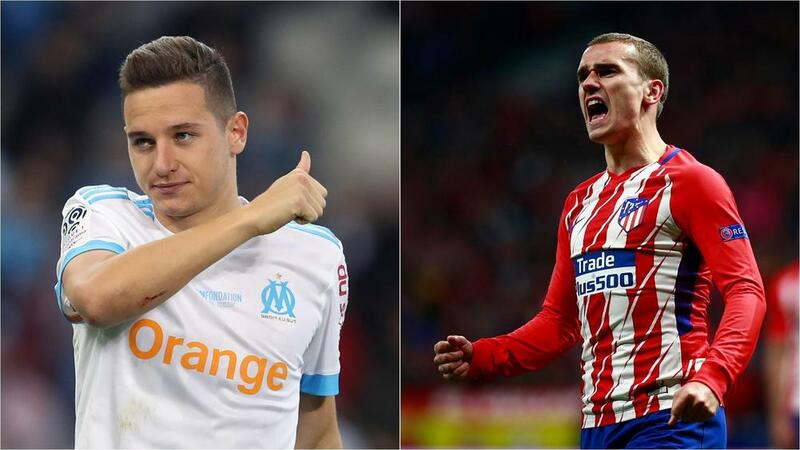 Griezmann and Thauvin are the two French players to have been involved in the most goals in all competitions from among Europe's top-five leagues this season. It is the Marseille man, though, who has the edge. His 26 goals and 17 assists put him at 43 goal involvements, three above Griezmann (27 goals and 13 assists). The next best three are Kylian Mbappe (21 goals, 16 assists), Dimitri Payet (10 goals, 22 assists) and Nabil Fekir (23 goals, eight assists). Although Thauvin tops the charts overall, Griezmann has arguably been the more ruthless in his time on the pitch. His 40 goal involvements have come in 3,750 minutes of action, whereas Thauvin has needed 3,981. He has also needed fewer shots on average (2.6, compared to Thauvin's 3.0) with a better accuracy (58.8 per cent, compared to 50.4). That said, on average, Thauvin has been involved in a goal once every 93 minutes, while his compatriot has managed one per 94. There is more to football than goals, of course, and it is fair to say both Thauvin and Griezmann are prepared to embrace all facets of their roles in their respective teams. Griezmann has made 33.2 passes per match on average, a number surpassed by Thauvin's 40.7. Their accuracy is matched at 78 per cent, though. The Marseille talisman has averaged three passes more than Griezmann in the final third of the pitch, but his success rate there is five per cent lower than his rival. However, if he has a greater propensity to lose possession in attack, he is also adept at winning it back. Thauvin has averaged 12 duels per game, three more than Griezmann, and won almost exactly half of them. DO MARSEILLE STILL NEED PAYET? Thauvin's form has been so good that Payet's injury scare in recent days has come as less of a blow than perhaps some would assume. However, there is no doubt the former West Ham man's absence would still be keenly felt. Aside from being the French player with the fourth-highest goal involvement of the season, Payet remains a passing master who could be key to unlocking Atleti's redoubtable defence. He averages 45 passes per game, with an accuracy of 80 per cent, while 21 of those in each match have come in the attacking third. All of that puts him above his France team-mates. Payet also boasts a rate of playing the final pass before a shot four times in every match, which again surpasses Griezmann and Thauvin, and shows why he remains a fearsome attacking threat.